Venice is a city in northeastern Italy sited on a group of 117 small islands separated by canals and linked by bridges. It is located in the marshy Venetian Lagoon which stretches along the shoreline, between the mouths of the Po and the Piave Rivers. Venice is renowned for the beauty of its settings, its architecture, and its artwork. A part of the city is listed as a World Heritage Site, along with its lagoon. (ref. wikipedia). The main train station is Venezia Santa Lucia, facing the Grand Canal. Before arriving at the station of Venezia Santa Lucia, trains stop at the station of Venezia-Mestre (Mestre is a mainland suburb of Venice). High speed trains connect Venice (both stations) with Florence, Bologna, Rome, and Milan. For example, you can get to Florence in only 2 hours. Most flights to Venice land at Venice's Marco Polo Airport. To get downtown, consider that all land services stop at Piazzale Roma, from where you have to switch to a vaporetto (waterbus) to get deeper into Venice. If you choose a public land transportation, from Marco Polo Airport you can use the ATVO Venice Airport Bus Express service (20 min. to get to Piazzale Roma). An alternative land transport service is provided by ACTV with its Line 5-Aerobus. To get straight to San Marco (the center of Venice), you can also take a direct water service, the Alilaguna ferry. Several low-cost airlines like Ryanair say they're flying you to "Venice", when they really land in the Treviso airport, about an hour's bus ride from Venice. See ATVO Treviso Airport Bus Express service (70 min. to get to Piazzale Roma). ACTV tickets can be purchased at the Venezia Unica ticket offices / agencies in the Historic Centre, included the ticket offices of Piazzale Roma and the Railway Station Santa Lucia. Consult this page for fares and special tickets. Click on the link "ORDINARY TICKETS WITHOUT VENEZIA UNICA CARD". You can buy a 75 minute navigation ticket for 7.50 € (this ticket can also be purchased on board). You can also buy (in advance) a special Ferry Ticket (one-way ticket: 5.00 €) for route no. 20 St.Mark’s S. Zaccaria - S. Servolo, to get to S. Servolo island that hosts the conference center. If you plan to come often to Venice, consider to buy a Venezia Unica Card. If used as a card for the public transport service, included navigation services, it costs 50.00 € and has a validity of 5 years. With this card, a 75 minute navigation ticket costs 1.50 € only. If you use Google Maps, when you click "Directions", select bus (public transport) to get the route from a given starting point to a destination by using vaporettos (see the ACVT service timetable page). For more information, you can contact the Hellovenezia call center,	open every day from 7.30 am to 8.00 pm. -	Phone +39 041 2424. The joint conference will take place at the Congress Center of the San Servolo Island, which is 10 minute waterbus ride away from Piazza San Marco. 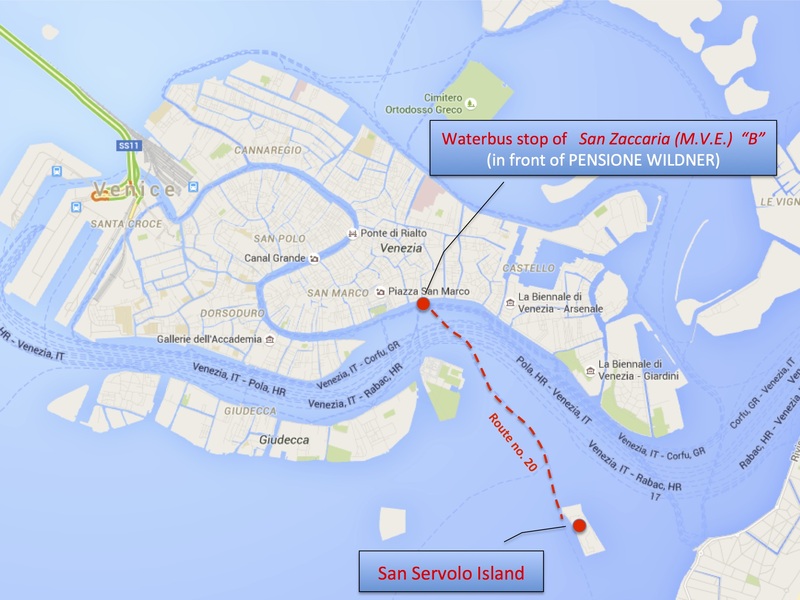 To get to San Servolo, take the waterbus route no. 20 from the stop of San Zaccaria (M.V.E.) "B". You can download the timetable of the waterbus line no. 20 from this link. 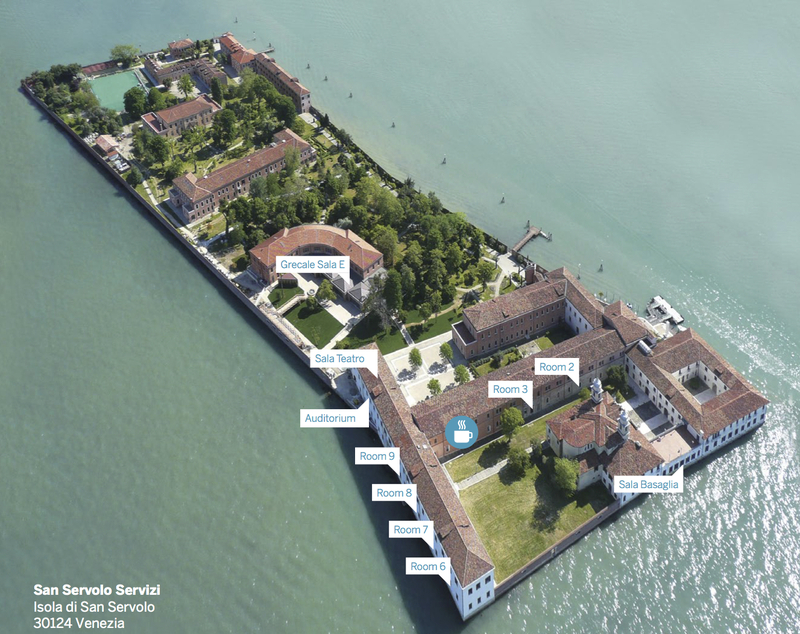 This is a beautiful aerial view of the island of San Servolo, with the indication of the conference halls and facilities.